St Mary Magdalene School is set on the corner of the wider Peninsula development and creates a civic presence on the gateway to the Greenwich Peninsula. The building sits on a 2 hectare site (19,300m²) and is a new 12,903m² through school consisting of two standalone buildings for a 26 place nursery, standard 2 form entry primary, standard six-form Secondary entry and a 300 place 6th form with associated sports facilities. The proposed building accommodates 1646 pupils and 200 staff members. The building will also act as a community hub, with the school and sport facilities being available for local community use. The building integrates measures for passive energy design, including optimised massing and orientation of the building, with high-performance building fabric and low U values. The external shading within the façade acts to minimise summertime solar gain, while the exposed thermal mass and night time ventilation modulates the internal thermal environment. The windows optimise the window-to-wall-ratio maximising daylight to the occupied space. 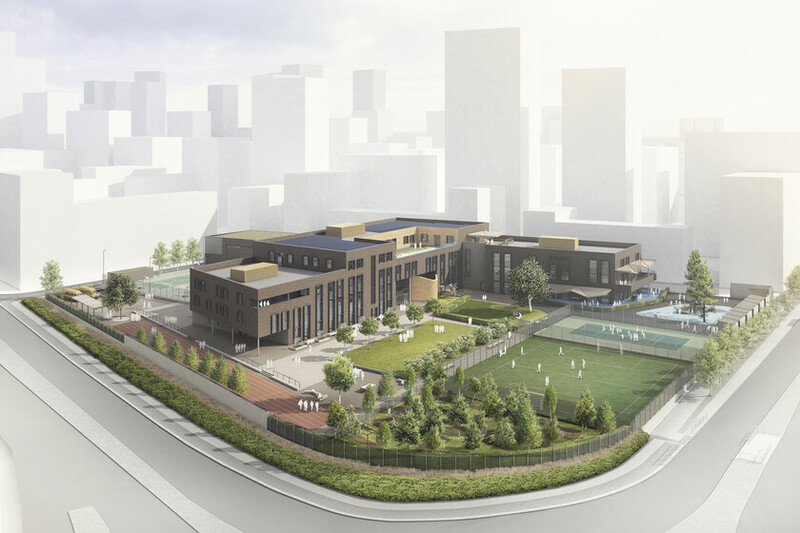 The development benefits from the close proximity to the Greenwich Peninsula Energy Centre with the school being connected to provide all the space heating and domestic hot water services. Air Source Heat pumps provide cooling to the IT intensive zones and the use of 700m² photovoltaics generate on site renewable energy. An holistic environmental strategy has been adopted for the scheme with the building aiming to achieve a minimum Excellent rating for BREEAM under the UK New construction 2014 requirements.